Matt Warman is the Conservative Member of Parliament for Boston and Skegness, first elected in May 2015. 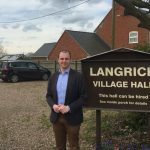 Retaining the seat for the Conservatives with a majority of 4,336, he campaigned on a commitment to improve communication between Westminster and the electorate, and increasing investment in Lincolnshire’s roads, broadband and public services. In 2017 he was returned to Parliament with an increased majority of 16,572. Prior to entering politics, Matt worked for the Daily Telegraph from 1999 until 2015, focusing for most of the period on technology, leading coverage of Facebook, Google and Apple, and covering the launch of products including iPhones, the BBC iPlayer and the Apple Watch, as well as interviewing key figures including the founder of Amazon, Jeff Bezos, and Sir Tim Berners-Lee, the inventor of the world wide web. In the 2015-2017 Parliament, Matt was a member of the Science and Technology Select Committee, and Co-Chaired the All Party Parliamentary Group on Broadband and Digital Communication and Pictfor (The Parliamentary Internet, Communications and Technology Forum). In January 2018, Matt was appointed PPS to the Rt Hon Karen Bradley MP, Secretary of State for Northern Ireland, having previously served as her PPS in the Department for Digital, Culture, Media and Sport from June 2017. Matt’s mother-in-law worked for the RSPB at Freiston Shore and his father-in-law was a long-serving science teacher at Boston Grammar School. Matt and his wife Rachel have known and loved Lincolnshire for more than a decade and live between Boston and Skegness with their young daughter.